When a medieval craftsman lovingly carved a representation of the four gospels for the cover of this book, he was using symbols that had been sacred for thousands of years before the birth of Christ. 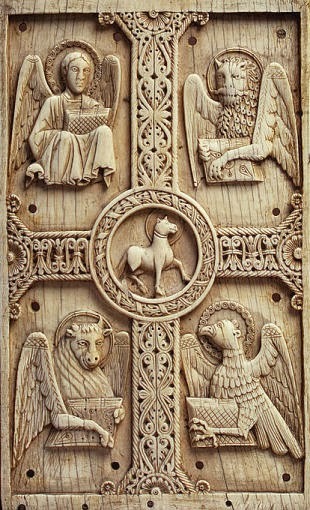 The four gospels – Luke, Mark, John, and Mathew – are commonly represented as a Bull, a Lion, an Eagle and a Man. These are the four fixed signs of the Zodiac – Taurus, Leo, Scorpio and Aquarius. Scorpio these days is usually depicted as a scorpion, but the eagle is also associated with that sign. 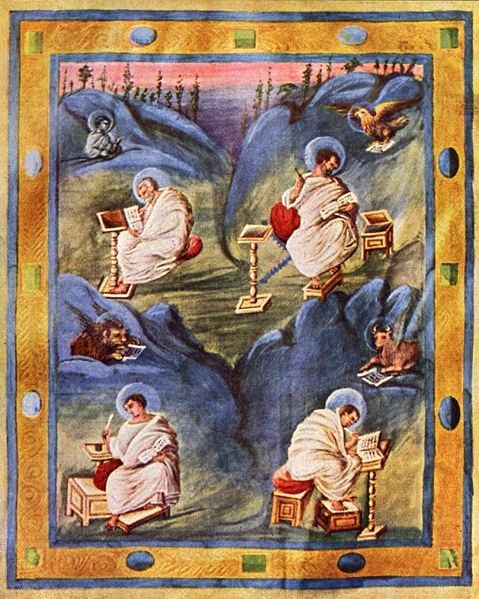 According to Christian tradition, the four evangelists are represented as animals because of two references in the Bible. The first is Ezekiel’s vision in the Old Testament (the King James version). Ezekiel, while a slave in Babylon, saw a vision of God in a chariot being pulled by four creatures. It’s not insignificant that he was in Babylon. This is where historians trace the origins of astrology as we know it. When Ezekiel was there, the 12 signs of the Zodiac were already known and astrology was in use. Furthermore, these fixed signs were considered to be symbols of kingly power. 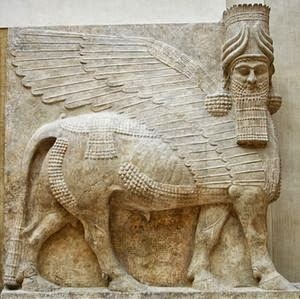 Statues of the winged Assyrian lion and bull were at the entrances to palaces. (Assyria was the empire which preceded Babylon in the same territory.) 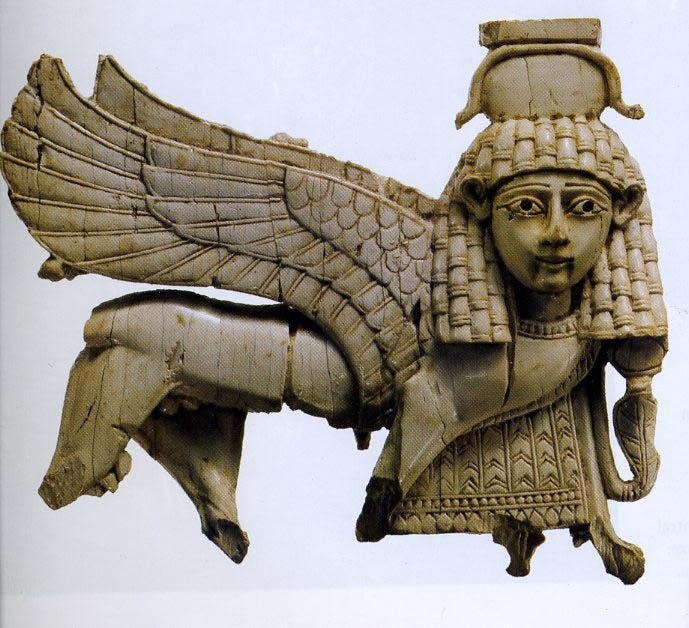 These creatures were a composite of the four fixed signs – the wings of an eagle, the body of a lion or bull, and the head of a human. The second reference in the Bible is in the Book of Revelations by John. I quote it at length because it’s splendid stuff. “Immediately I was in the Spirit. Behold, there was a throne set in heaven, and one sitting on the throne that looked like a jasper stone and a sardius. There was a rainbow around the throne, like an emerald to look at. “Around the throne were twenty-four thrones. On the thrones were twenty-four elders sitting, dressed in white garments, with crowns of gold on their heads. Out of the throne proceed lightnings, sounds, and thunders. There were seven lamps of fire burning before his throne, which are the seven Spirits of God. Before the throne was something like a sea of glass, similar to crystal. Those four ancient Near Eastern symbols of power become four symbols of the Christian god’s might. it’s a really interesting article! Yes, very interesting. I was thinking about Ceres, at it being made a dwarf planet, and wondering how the increase in female asteroids were perhaps now redressing the balance of male and female ‘gods’ or archetypes. I read up about asteroid Eris, (dyscordia) which led me on to Enyo. I didn’t realise Mars had a sister, Enyo, who went into battle with him, and how well-known she was. I’m wondering if there really was a male/female balance of power in antiquity or if religions were always entirely male dominated. I think there was much more of a balance. These symbols come from a land where the chief god was Ishtar or Innana. Sorry for grammar – tired. Thank you Christina for this most excellent article, I have sensed there is a connection between christianity and astrology lately and this just adds to the evidence. To the best of my knowledge, the KJV of the bible is the most authentic but readable as written in old english. And thank you right back. Unless you read Greek – which I don’t – all translations of the Bible must reflect their times. For example, I think I read somewhere that in the above piece the eyes all around are a mistranslation, but I’d need to investigate to be sure. I like the KJV because the language is so powerful. It is just archaic enough to be a little strange yet modern enough to read easily. Translations of the Christian Bible are open to debate and academic efficiency no doubt, but the best way to “test” or “verify” any of the religious wisdom is to observe it in your own or others lives.. after all, the proof is in the pudding so they say… at least thats what I try and do.. but yeah, the link between western astrology and the Christian bible is most certainly valid. When I was in college, a professor who was into astrology pointed out that the Christian symbols “loaves and fishes” referred to the Pisces/Virgo axis, and represented the Age of Pisces. Perhaps this explains why the Old Testament gets so worked up about eliminating the Golden Calf, symbol of the Age of Taurus.